Falcon Windows: the installer of choice for Solidor solid timber core composite doors to secure and brighten your home in Ipswich Suffolk and Essex. Exterior doors - it's only natural that they should be solid and secure to protect your property, but it's important that they look good - and stay looking good - too! That's why at Falcon Ipswich, we're pleased to offer an impressive range of doors manufactured using 'cores' of real, solid natural hardwood, set in ultra-secure high-performance frames, coated in long-lasting thermo-plastic skins. 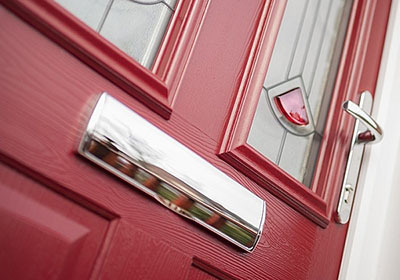 Our British-made, exterior doors from Solidor are simply the most secure composite door on the market. Combining the strength and thermal efficiency of natural renewable hardwood with robust innovative frame design in man-made materials, they offer the best of both worlds and have excellent green credentials as a result too. Think that 'solid timber' sounds like hard work and endless pots of varnish or flaking paintwork? Think again. A composite solid timber core door from Falcon Windows Ipswich has a thermo-plastic skin that's robust and extremely scratch resistant - it's certainly not just a gel finish or stain on the surface. This clever, simply-wipe-down-with-soapy-water system provides 'through-colours' and even more colour and finish options. What about walnut? Or duck egg blue perhaps? You can choose what you'd like to see on your front door colour-wise inside and/ or out. There's even a range of 18 colour combinations for the door frames - and they come in chamfered or sculpted styling too! And when it comes to door designs, Solidor's collection includes everything from modern, clean-line elegance to cosy cottage or countryside types and the smart and popular Victorian-style town house-look. At Falcon Ipswich we've a reputation for going the extra mile for our customers and we recognise when suppliers share that commitment to quality. For example, Solidor solid timber core composite doors are 10% thicker by design than other solid timber exterior doors on the market. Solidor exterior doors also include 'Ultion' locks as standard which include a molybdenum alloy core that's 25% denser than iron. This clever security system has a hidden lock which automatically engages when it detects attack, so that even when snapped twice nothing gets past it. In fact, even leaving a key on the inside of the lock won't affect its performance either. Optional integral aluminium threshold for mobility access. Mindful of the future? 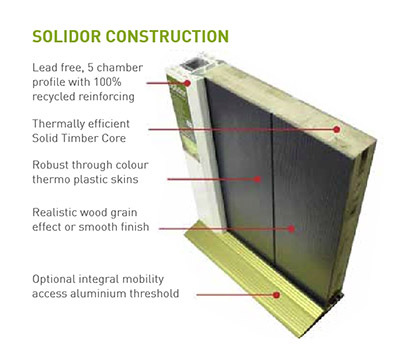 A solid timber core exterior door is a long-life option and it's good to know that the timber used by Solidor is also independently certified to be sourced from sustainably managed forests. The British-made - hence lower carbon footprint - units also use 100% recycled materials in the thermally efficient frame reinforcing systems and the door skins, edge-banding and profiles are lead. What's more, when exterior doors reach the end of their useful lives, they all too often end up in landfill due to the non-recyclable nature of materials used in their construction - but not the Solidor. What Solidor door design will you choose for your home? What about the glazing, door furniture and those all-important colours and finishes? With such a wide range on offer, you're sure to find something to suit your property, its location and of course, your own personal taste. Click here to go to our brochures page where you can find our Solidor solid core composite door brochure including designs, glass styles and wide range of colour and finish options. To find out more about Solidor solid timber core composite doors and how they can make a difference to the security of your home, contact us.